The market continued to move higher last week and did so more convincingly than the previous week. It opened on Monday with a gap up of more than 20 points and Tuesday saw another opening gap up, this time smaller (around 7 points). The high of the week came very close to the ATH, before the market retreated a bit in the last 2 trading sessions. Our preferred EWT scenario (bullish) played out, despite the initial chop which had us question the validity of this (presumed) 3rd wave. Now it looks like this wave up might need another high before finishing and the coming correction from there will be telling to see if this is indeed a bullish impulse up or not. As it looks right now and in accordance with our thoughts from the previous newsletter this doesn’t look like a “real” 3rd wave up, which has us thinking it might be part of a more complex correction which started at the ATH (potentially a B wave of a flat). But we will burn that bridge once we come to it. 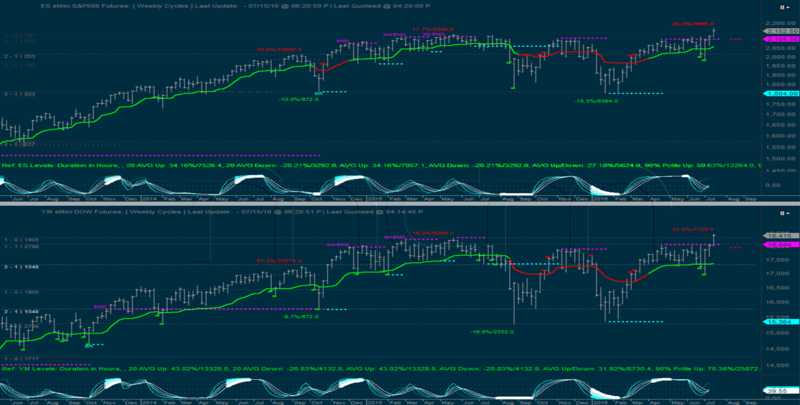 Weekly cycles did not trigger any new signals. Directionality is still moving lower which is a sign that it is not time to sound the all clear for the bulls just yet. The daily cycles continue to unwind the up impulses. 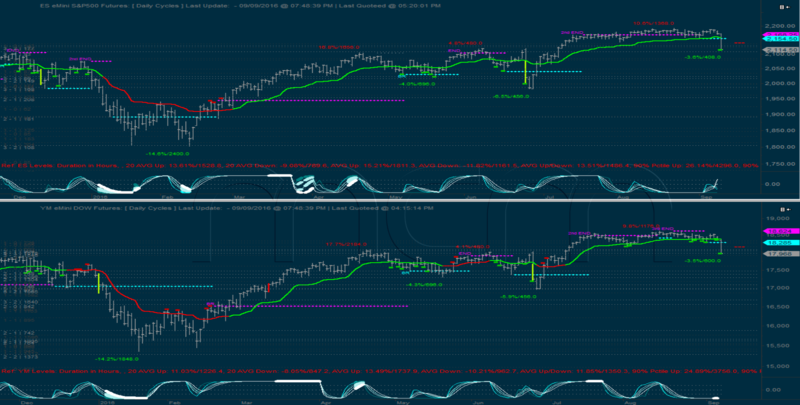 ES triggered a 2nd END resistance, while YM also triggered an END resistance level. This is a sign that the upward energy of these impulses is dissipating. Considering that this is already a nested up impulse (an impulse following another impulse), it is unlikely that the market will have enough strength to break above these resistances and create another nested impulse. That being said, a marginal new high is not excluded, but we do not expect the resistance levels to be broken above significantly. After moving sideways 2 weeks ago, the holiday shortened week brought a clearer direction, which was down. The market was weak in all 4 trading days and finished at the lows on Thursday. The short term EWT scenario we kept referencing is very close to a resolution now. The low close to 2320 is all important and the separation line between the bullish and the (very) bearish scenario. It did not get taken out yet, so the bullish scenario is still preferred. However the market came quite close and is still too close for comfort for the bulls. Which is why Monday is likely to bring a resolution, one way or the other. Both scenarios point to a strong next move, so the action from here will likely affect the intermediate term trend. No big change on the weekly cycles. ES is now testing the mcm-MA again and will be interesting to see if this will provide support again. Directionality continues to move lower. 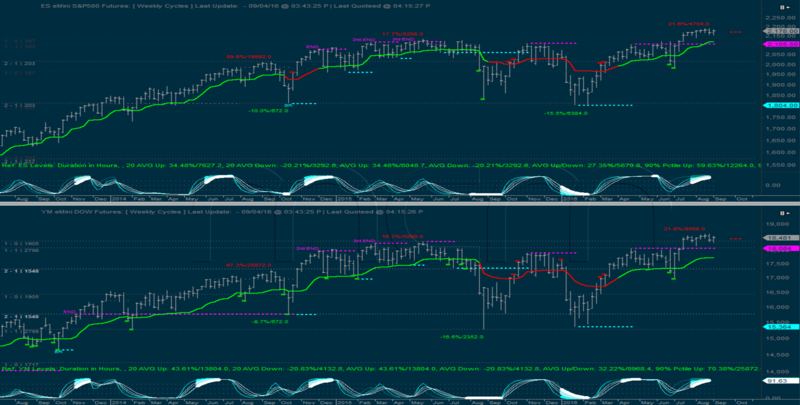 The daily cycles saw an interesting development last week. ES triggered already an END resistance, which had shifted the expectation down once it confirmed. YM did not trigger one yet, so the support on daily YM is still valid. Directionality is still stuck at the minimum level, and is getting a bit long in the tooth for a bounce. As mentioned already several times in the previous newsletters, the normal expectation was for the market to back-test the break-out above resistance. This is exactly what happened last week as market dropped with conviction and ES is now back-testing the impulse up break-out. YM is diverging again having already failed the back-test by dropping below the resistance level. Of course, YM never confirmed the up impulse, so the ES back-test is more important. What happens next is key and the normal expectation would be for the previous resistance to provide support even if, in the end, it will fail. On the daily cycles, we can see nicely the brutality of the decline. The market basically lost aprox. 80 points in just 2 days and sliced directly through the support levels. In fact ES is now close to confirm a down impulse. As we were mentioning last week, breaking directly the support levels before resistances trigger is very bearish, although it depends a lot on what the market does in the next 2-3 days. If the break-down is confirmed and the market cannot manage to bounce back to or even above the support levels, then the bearishness will be confirmed. We do have to mention that both ES and YM triggered LREs (lower risk entries) for longs on Friday, so a near term bounce (maybe after a minor new low) would be normal expectation based on that. Both 480 and 288min cycles triggered new resistances close to the highs after which the market dropped strongly. It is interesting that support levels did not trigger, so once they will, they will be very important with a bounce from there being the normal expectation. In conclusion, after being range bound for quite a while the market finally broke out, or better said down. We have confirmed down impulses on all short time frames - 5, 15, 60, 135 (not shown) and we broke below support on the daily cycles as well. The speed of the decline was very high so the market is short-term oversold, however it is important to see if but also how the bounce will shape up. All the impulses down need to unwind, so some bounces followed by corrections to put in BRs and ENDs is the normal expectation. Bigger picture, the break-down below support on the daily is very important and if the market does not bounce towards the break-down levels in the next 2-3 sessions, that will be a serious warning for longs. No big change on the weekly cycles. ES is in a confirmed up impulse, while YM still needs the mcm-MA to also cross the broken resistance level before confirming the up impulse. It will be interesting to see if that will happen. As previously stated, the normal expectation is for the market to back-test the break-out level and in our case, that back-test becomes very important to see if the market can sustain the up impulse or not. On the daily cycles, there was an important development last week. Both indexes triggered support levels, so the normal expectation near term is for the market to head higher until resistances are triggered. YM already put in a 3rd END resistance, meaning the up impulse finished the unwind and the index is now in a normal oscillation. 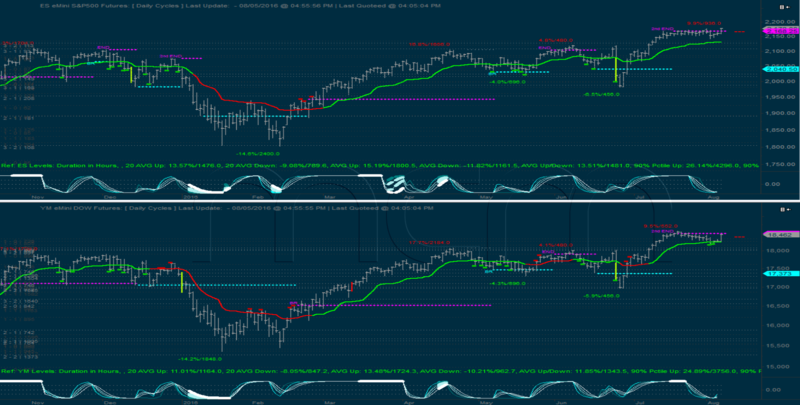 However ES only had a 2nd END resistance and so the next resistance becomes very important since it will be a 3rd END resistance; and will mark the end of the impulse unwind also on ES. If the market breaks directly the support levels before resistances are triggered higher, that would be more directly bearish. 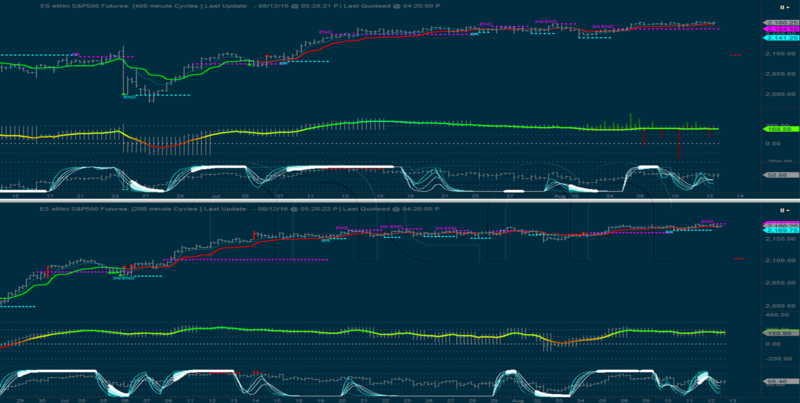 Both 480 and 288min cycles unwinded 2 consecutive up impulses with 3rd ENDs and are now oscillating, having had already support levels trigger. The market bounced enough from there to make it possible for the resistances to trigger any time. Reaction to those will be important, especially since we started getting quite a few LREs (lower risk entries) for shorts lately on both cycles. No real change on the weekly cycles, except the fact that the continued grind higher made the predictive pivot move higher. 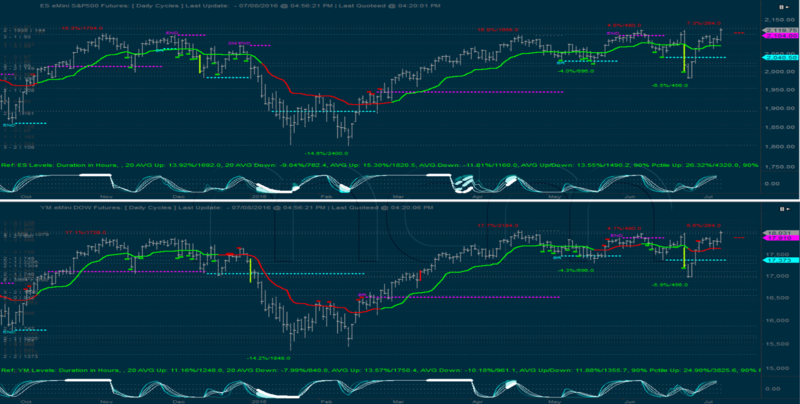 The up impulse on ES is still not confirmed, but if market holds up it could in the next 1-2 weeks. YM is still dragging on this and needs more time to (potentially) confirm. 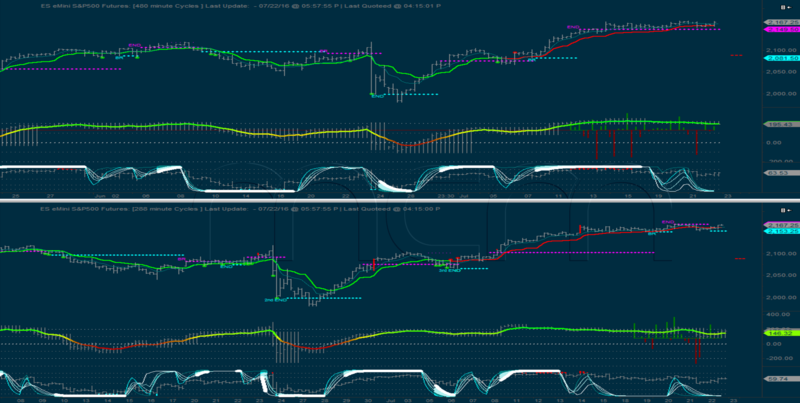 The action on the directionality tool is not very bullish with the lines becoming thick, but it doesn’t mean the market will turn immediately either. We have to look to the shorter time frame cycles for near-term clues. 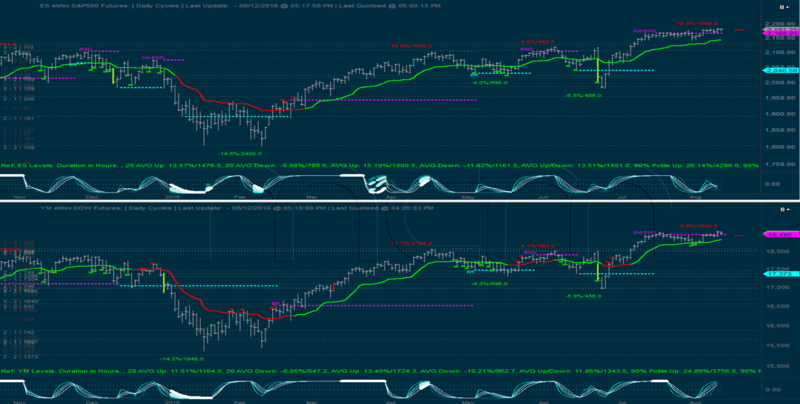 On the daily cycles, both ES and YM managed to break above the resistance levels in the form of a 2nd END. It thus becomes very important to see if the market manages to stage a real break-out from here. Directionality bounced from the lowest level, however it is turning back down on ES, so it’s important to see what it will do next. 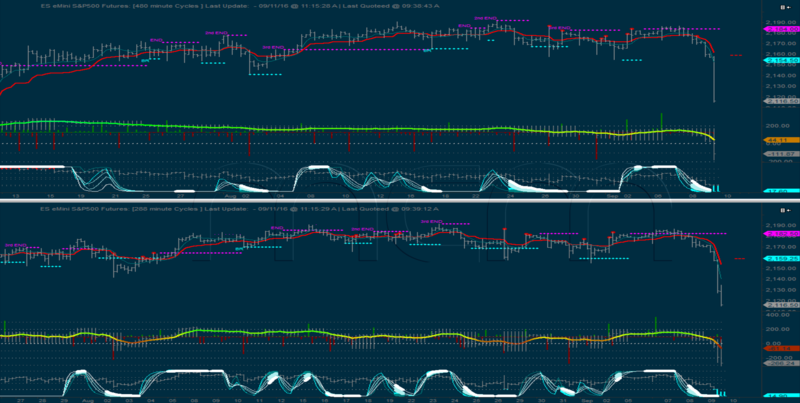 480 and 288min cycles show the plateau the market reached, after which it actually didn’t move much. 288 started a new impulse up and already began to unwind it, having an END resistance at last weeks’ highs, close to 2185. 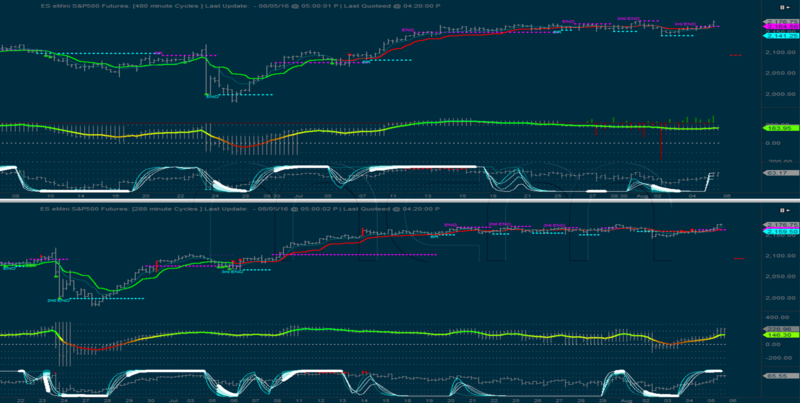 480min actually managed to break over its 3rd END resistance and confirm a nested up impulse. Those 2 levels become very important for the near term since coming back below the break-out level on 480 would cancel that nested impulse and the bullish momentum, while breaking above the END resistance on 288, would mean more up movement is likely. The first 2 days of August were quite weak, the market going from a new ATH in ES around 2177, to head-faking a break-down of the range in which it had been stuck since mid July. The low was close to 2140 and from there the market proceeded to make a new ATH. 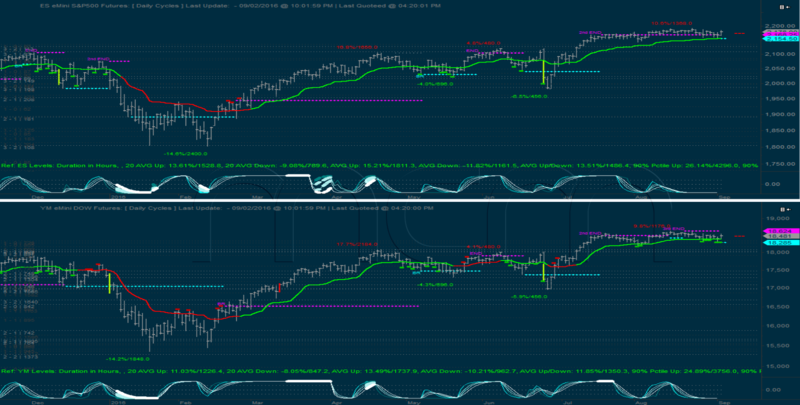 Now ES looks close to confirming its up impulse on the weekly cycle, while YM is still far from that, having underperformed quite a bit. 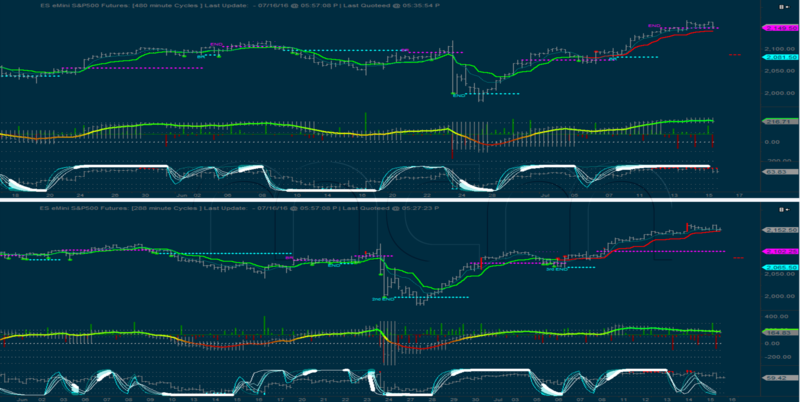 Directionality is still going up and will be important to see how it behaves once it meets the maximum value. 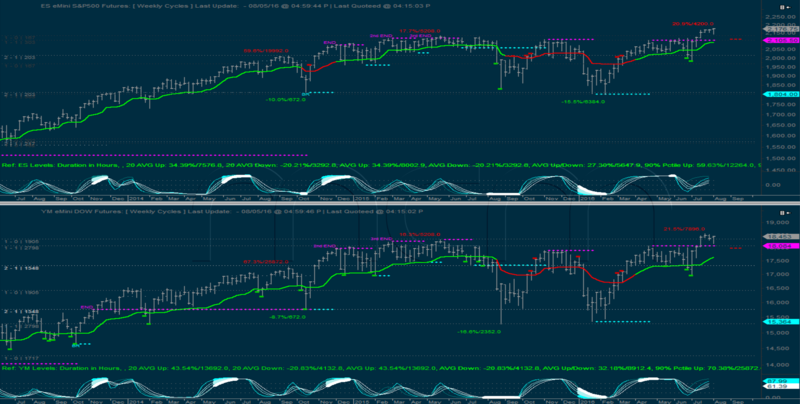 The daily cycles show the market slowing down once it reached the resistance in the form of a 2nd END. It even drifted a bit down from there, but this recent ramp is testing the resistance level once again on YM, while on ES it already spiked a bit above. Directionality almost made it to the lowest point so the next 1-2 days look important to see what it will do from there. The normal expectation is still for the resistances to hold and market to have a bigger correction before another bigger bounce. The 480 and 288min cycles both completely unwinded the up impulses they had, with 288 having been oscillating for a while, while 480 having just recently triggered a 3rd END resistance. Both the last resistances on 288 and the 3rd END on 480 have been broken above and are close to confirm new up impulses. Given the 3rd END on 480, the odds are low that it will be broken through significantly, so a pull-back below it would be normal expectation. Considering that 60 and 135min both broke into big up impulses (not shown), if they start to unwind sideways, that would be an indication that the break-out above resistances on 288 and 480 will likely be short lived. If 288 and 480 manage to break out significantly though, that would mean another leg up is underway. The market basically did nothing but move sideways in a tight range, putting in a frustrating week. One interesting aspect to note is the fact that YM started to under-perform ES quite significantly. This can be seen also when looking at the potential break-out into an up impulse. The mcm-MA is close to confirming the up impulse on ES, but needs a lot more work on YM. Directionality continued to bounce, but didn’t make it to the max value yet, so going forward it will be important to see if it will. Another interesting aspect is the fact that the predictive pivot sits now very close to the resistance levels (highlighted on chart), which adds weight to the expectation that the market will come back to test that level. Reaction there will be critical to watch for confirmation or failure of the (potential) up impulse. 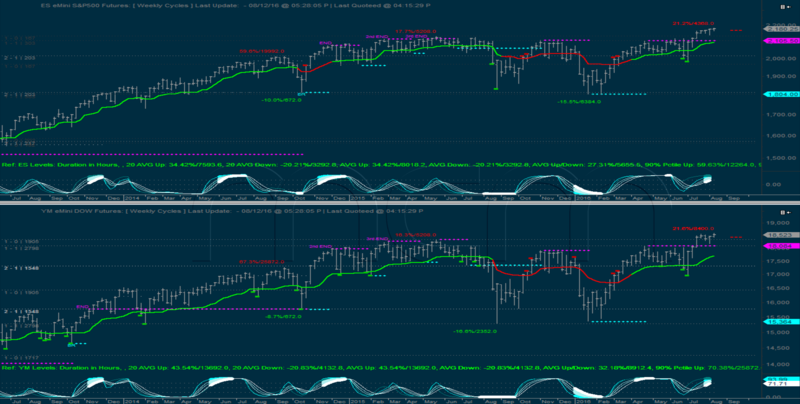 The daily cycles show even better the under-performance on YM. 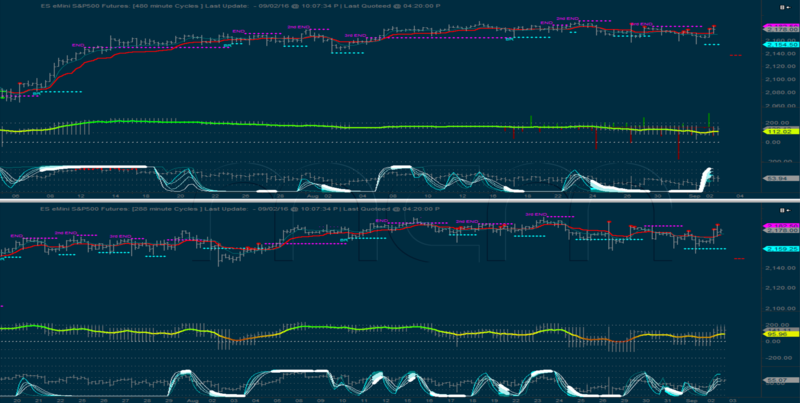 While ES moved flatish to up, whipsawing the 2nd END resistance, YM drifted down from there. The directionality tool also started to move down and watching to see if it makes it to the minimum level will provide clues as to whether we will get the normal expectation of down movement from resistances or the market will attempt to spike (or even break) through. 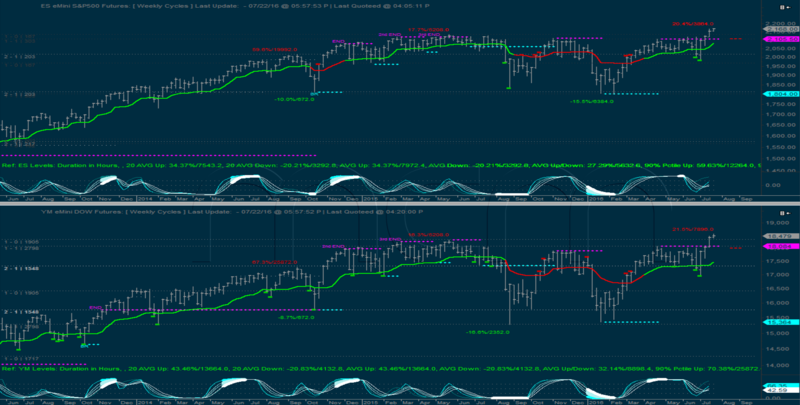 The 480 and 288min cycles show nicely the unusual action from the last 2 weeks. ES only moved between 2151 and 2171 and has chopped the nerves of both bulls and bears. The 288min finished it’s up impulse with a 3rd END and is now oscillating, having a recent resistance at 2168.25. 480min is in a nested impulse up, which already had a 1st END, a new support and now we are on the look-out for a 2nd END resistance, which is likely to point the direction back down. Interesting is that the directionality tool moved to the lowest level on 480min and stayed there despite the choppy bounces. On 288 it bounced only recently, so the next 1-2 days will be important to see if it gets to the max value (pointing up) or it will be a failed bounce (pointing down). 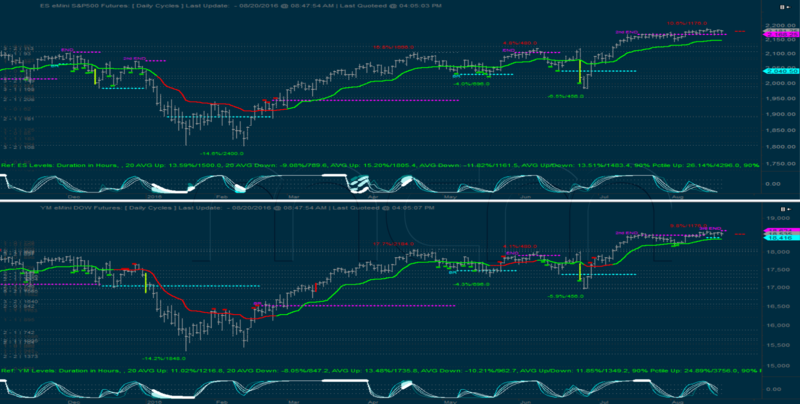 In conclusion, the cycles show that downside risk is more significant than upside risk. The market did break-out over the resistances on the weekly and if the up impulses are confirmed, that would need to be respected. However the daily cycles are in the unwind phase of the huge up impulse, having put in a 2nd END resistance. It is unlikely that after such a big run, the market will have enough energy left to push through the resistances for more than a brief spike, before a more significant pull-back. The 288 and 480min are also unwinding up impulses (288 is oscillating already), which points to the same conclusion: the market is dissipating the energy from this huge rally and looks more close to a top than an intermediary bottom. That being said, if the shorter time frame cycles 288/480min but also 60/135min (not shown) will break into fresh up impulses, that would be an early warning that the market is indeed trying to push upwards despite the odds. The market continued the relentless up move, albeit at a slower pace. As mentioned last week a potential break-out and up impulse on the weekly cycles is now on the table, as price moved significantly above resistances. The direction in the next 1-2 weeks will be critical for confirmation (or not) of the up impulse. If the markets travel back down, the back-test of the resistance level became also very important to watch, as it is now support. The bounce started by the directionality tool continued and going forward it will be important to see if it gets to the maximum value or it will be a failed bounce. Last week a significant development was registered on the daily cycles. A 2nd END resistance was triggered pointing to the continuing unwind of the up impulse. This 2nd phase of the unwind was unusually strong and as a result this sub-wave is a lot bigger than the 1st unwind (1st BR and END). The normal expectation now is for the market to correct until a new support level is triggered which will likely lead to another bounce to a 3rd END and complete unwind of the up impulse. 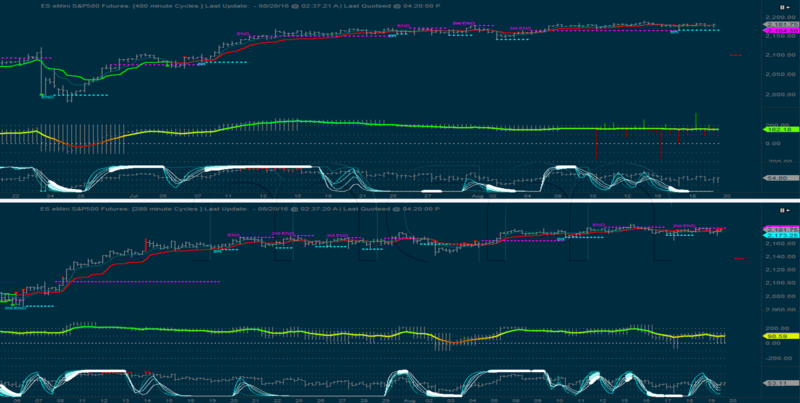 The 480 and 288min cycles are both in up impulses. 288 is already in the unwind phase, having had already an END and a following support, so a 2nd END could trigger soon. 480 is in a nested impulse which, even if it confirmed, never really broke out from the vicinity of the resistance, so it could still be reversed directly. 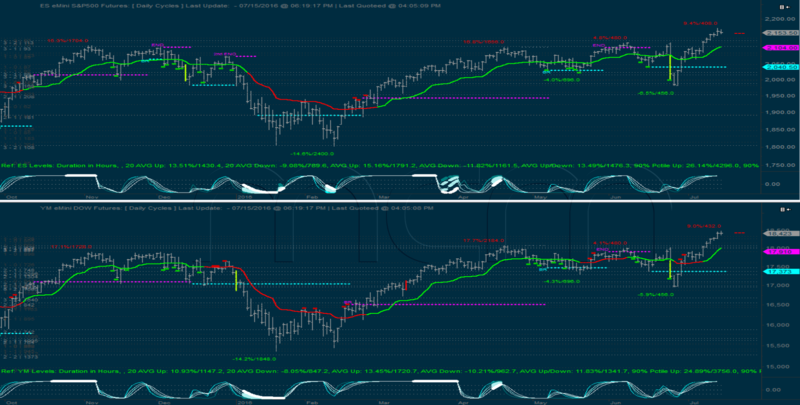 It is interesting that the directionality tool on both fell and at the moment is bound at the minimum level which is usually a sign for weakness. Near term it will be important to see if it stays there or it bounces. 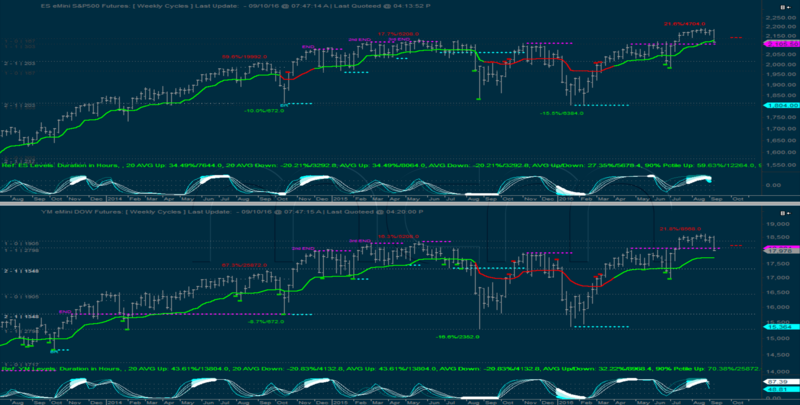 The market continued to rally, making new all time highs and now both ES and YM moved above their weekly cycle resistance. The price traveled enough upwards to put the scenario of a potential break-out on the table. It doesn’t mean that this will happen, but it does mean that if the market travels back down, a back-test of the resistance level will be very important to watch, since it could act now support. The directionality tool never made it to the lowest point and started to bounce and its behavior is also important to watch going forward. The daily cycles are still in the unwind phase of the up impulse. We were mentioning last week that the exact turning point and trigger of the 2nd END resistance has some room, however the market moved a lot higher which makes the form of this 2nd unwind less than ideal. Once the 2nd END triggers though, that would be an important line in the sand and potential turning point. 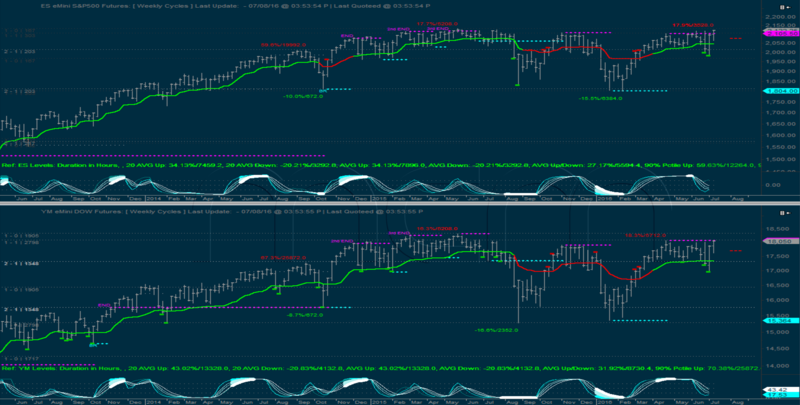 The 480 and 288min cycles show the relentless upward action in more detail. 288 is in an up impulse which still needs an unwind phase, while 480 unwinded its up impulse with an END resistance. That level was spiked above, however the market looks close to coming back down below it. Going forward the normal expectation is for some down movement, until support levels in the form of a bullish retrace (BR) will trigger (potentially on both). Those levels will be important to watch for reaction. The directionality tool is also important, with the one on 288 getting close to its lowest level. Behavior there will be telling for the near term direction. As we were mentioning previously, on the weekly cycles we had 2 consecutive LRE (lower risk entry) for longs which the market respected, rallying strongly. The resistance levels are currently being tested, with ES managing to spike above once again, while YM stopped exactly at that level. 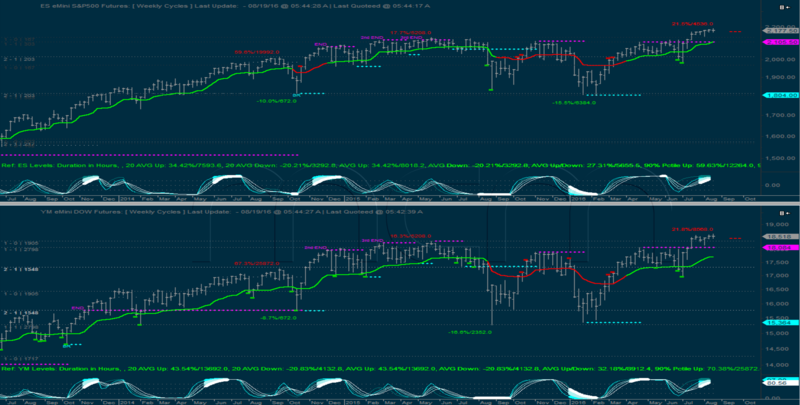 The directionality tool kept moving down however some of its components started to bounce. The normal expectation is unchanged, namely for the resistances levels to hold and the market to have a bigger correction from this general area. 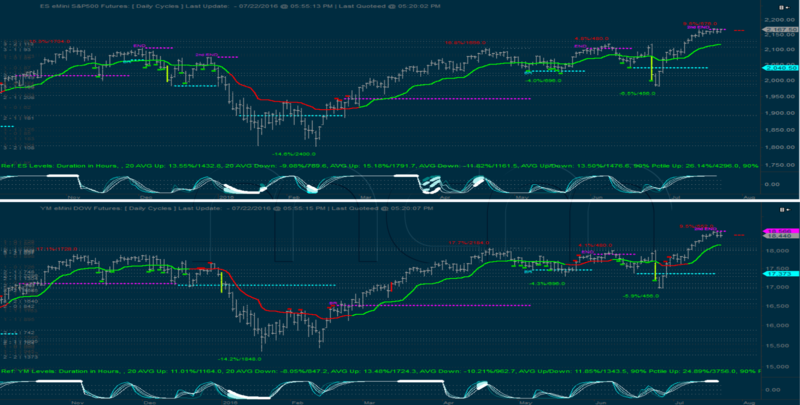 The structure of the daily cycles adds weight to this assumption, however with the market testing the ATHs, next week looks decisive for a decision to be made one way or another. The daily cycles are continuing to unwind the up impulse. After the Brexit vote, the market spiked below the 2nd BR (bullish retrace) support, however the market rallied strongly from there and made a higher high vs the day before the vote. From a cycle perspective the price is in an area in which a 2nd END resistance could trigger basically at any time. Once that happens, that could mark the end of the impulse, which is suggesting that the up-driving energy is close to fully dissipating. That is not favorable to continuing upside, although the exact turning point has a bit of room. The shorter term cycles should provide early clues for that. The 480 and 288min cycles show a “zoomed-in” version of the post Brexit action. After marking the first low with an END and 2nd END support and having those supports spiked below by the lower low, the ensuing rally was very powerful. Resistances were triggered, but unable to contain the rally and both started impulses up. 288min reversed that impulse up and triggered a 3rd END support lower, then another resistance higher, which was broken as well by the relentless upside. 480 managed to keep its initial up impulse intact and triggered an BR (bullish retrace). The next important level to watch would be an END resistance on 480, which would likely mark the unwind of the up impulse.